Vermeer worked slowly and with great care, and frequently used very expensive pigments. He is particularly renowned for his masterly treatment and use of light in his work.Vermeer painted mostly domestic interior scenes. "Almost all his paintings are apparently set in two smallish rooms in his house in Delft; they show the same furniture and decorations in various arrangements and they often portray the same people, mostly women." He was recognized during his lifetime in Delft and The Hague, but his modest celebrity gave way to obscurity after his death. He was barely mentioned in Arnold Houbraken's major source book on 17th-century Dutch painting (Grand Theatre of Dutch Painters and Women Artists), and was thus omitted from subsequent surveys of Dutch art for nearly two centuries. In the 19th century, Vermeer was rediscovered by Gustav Friedrich Waagen and Théophile Thoré-Bürger, who published an essay attributing 66 pictures to him, although only 34 paintings are universally attributed to him today. Since that time, Vermeer's reputation has grown, and he is now acknowledged as one of the greatest painters of the Dutch Golden Age. It is unclear where and with whom Vermeer apprenticed as a painter. There is some speculation that Carel Fabritius may have been his teacher, based upon a controversial interpretation of a text written in 1668 by printer Arnold Bon. Art historians have found no hard evidence to support this. [Montias 3] Local authority Leonaert Bramer acted as a friend, but their style of painting is rather different. Liedtke suggests that Vermeer taught himself, using information from one of his father's connections. [Liedtke 2] Some scholars think that Vermeer was trained under Catholic painter Abraham Bloemaert. 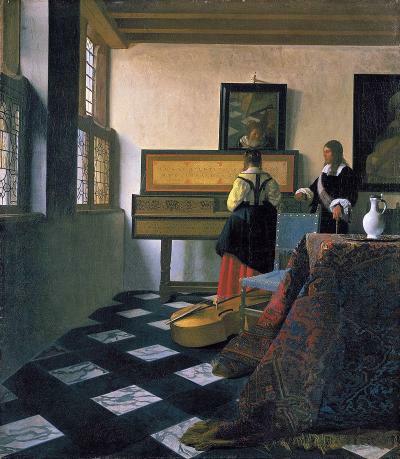 Vermeer's style is similar to that of some of the Utrecht Carravagists, whose works are depicted as paintings-within-paintings in the backgrounds of several of his compositions. On 29 December 1653, Vermeer became a member of the Guild of Saint Luke, a trade association for painters. 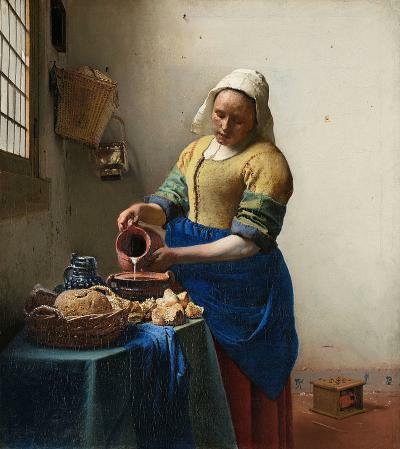 The guild's records make clear that Vermeer did not pay the usual admission fee. It was a year of plague, war, and economic crisis; Vermeer was not alone in experiencing difficult financial circumstances. In 1654, the city suffered the terrible explosion known as the Delft Thunderclap, which destroyed a large section of the city. In 1657, he might have found a patron in local art collector Pieter van Ruijven, who lent him some money. It seems that Vermeer turned for inspiration to the art of the fijnschilders from Leiden. Vermeer was responding to the market of Gerard Dou's paintings, who sold his paintings for exorbitant prices. Dou may have influenced Pieter de Hooch and Gabriel Metsu, too. There is no other 17th-century artist who employed the exorbitantly expensive pigments lapis lazuli or natural ultramarine either so lavishly or so early in his career. Vermeer not only used this in elements that are naturally of this colour; the earth colours umber and ochre should be understood as warm light within a painting's strongly lit interior, which reflects its multiple colours onto the wall. In this way, he created a world more perfect than any he had witnessed. [Liedtke 3] This working method most probably was inspired by Vermeer’s understanding of Leonardo’s observations that the surface of every object partakes of the colour of the adjacent object. This means that no object is ever seen entirely in its natural colour.